Swatched! : Zoya Matte Velvet Winter 2009 + one more! 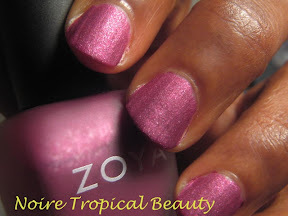 So I have been impatiently waiting for my shipment of the latest Zoya matte collection. I ordered these since mid-Septmeber and they took about a month to come. Boy, I checked my mailbox every single day! 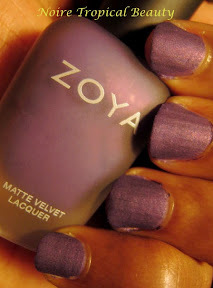 The folks at Zoya tweeted that they had to rework the formulas to make them more matte hence the delay in the shipment. Glad to hear that they really try to put out a quality product. I’ve had lots of fun testing out polishes using the Essie Matte About You topcoat, but sometimes you have to just buy the matte polish as it is just that gorgeous!!! 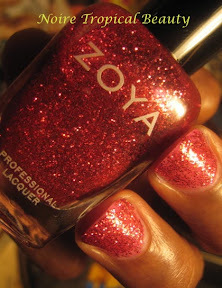 Enter the Winter collection for Zoya. I can tell you it was well worth the wait for these colours! Once again Zoya brought out three A-mazing colours encased in a frosted glass container with easy-to-use rubberized cover. I really, really like this packaging. At first glance, the colours in the bottle are really rich and pigmented with silver shimmer. These colours are beautiful! Especially that purple one! You KNOW I had to get that one! They all applied great and took a little longer to dry which allows you to smoother, cleaner finish and once again, they dry matte but the tiny shimmer particles give it great dimension so it’s not flat. They really created some unique matte colours. These are must haves and they’re one of the best matte collections out there. Get them! All have 2 coats. These also were not the easiest to photograph. Still working on my photography skills. Any tips? Harlow is a midtone rose with a hint of purple. Almost fuschia. It’s on the cooler side but it’s a really nice colour. This photo’d mostly true to colour. Veruschka is a deep, hunter green and the silver makes it very festive, great for the holidays. This is my second favourite! For some reason this photo’d grey, it’s a dark, but bright green. Savita is a rich, royal purple. What a regal colour!!! Of course this is my favourite one!!!! It’s dark but still bright enough to be seen as purple. This one is coming across as more of a blue-purple. It’s actually a true purple. It would look great with a grey sweater or something – especially on darker/tan skin. I need to play with these colours in a manicure, maybe mixing the matte and adding some gloss. Oooooooo! So, I ordered only one of the Zoya Ultra Glitter polishes. I got Astra, which is a reddish pink jelly polish base with red, pink and silver glitter. I only applied 2 coats, but I think you need 3 for full coverage. The glitter is bright and applied fairly smoothly and the surface was pretty smooth. You’ll need to use extra nail polish remover to get all the glitter off of your fingers. You might shimmer for a day or two. I think I’ll get the other two colours but I am not sure I’ll wear this all day everyday. I think they’ll make a good accent colour or added as a top coat for the holidays.